The Hon Faddy Zouky OAM has an intrinsic academic grounding in Commercial Law, and has taught in this area at Monash University for over 14 years. Combining this with his extensive commercial experience as an entrepreneur, Faddy has a profound understanding of his commercial clients’ needs. His Excellency Michel Aoun the President of the Republic of Lebanon, Foreign Minister Gibran Bassil and Prime Minister Saad Hariri appointed Faddy as The Honorary Lebanese Consul General to Tasmania in 2018. Faddy’s passion, commitment, highly successful association with governments and their counterparts not only from Australia, Lebanon but beyond, in promoting bi lateral trade, boosting economic stimulus, providing a platform for business networking and a plethora of opportunities, exemplifies his overwhelming, humane, sincere, hardworking, charismatic, the list is endless characteristics. Faddy has been awarded the Order of Australia Medal (OAM) for his contribution to the business community in Victoria. Faddy is also the United Nations’ Australian Ambassador for the UNDP Live Lebanon Project; the Founding President of the Australia Lebanon Chamber of Commerce and Industry (ALCCI); a pilot; a mentor to young entrepreneurs; and the Executive Director of the fastest-growing retail / hospitality entity in Australia, the Zouki Group. Faddy is widely known for his business acumen and community profile. Esteemed for his charisma, keen business-sense and vision, he is recognised as the individual responsible for successfully lobbying both the Australian and Lebanese Governments for their support of the ALCCI and its aim of encouraging entrepreneurial interaction between these two nations, and for subsequently leading the first Australian trade mission to Lebanon. 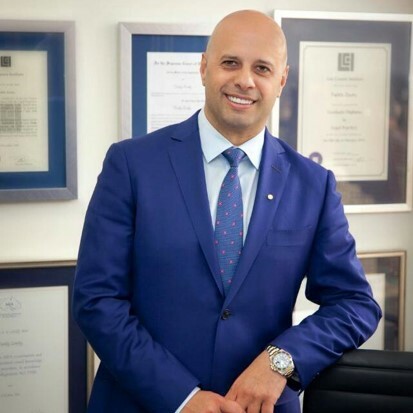 Highly respected as a business developer and spokesperson for the Australian Lebanese community, Faddy Zouky has changed the lives of countless people as a legal advisor and migration agent; as an employer who has created more than 5,000 jobs for locals; as a Community Advisor with SBS; and through his generous acts of philanthropy. 2013 Managing Partner, Blackstone Waterhouse Zouki Lawyers Melbourne. 2011 Founding Director, Chair and President of the Australia Lebanon Chamber of Commerce & Industry (Vic) Limited.